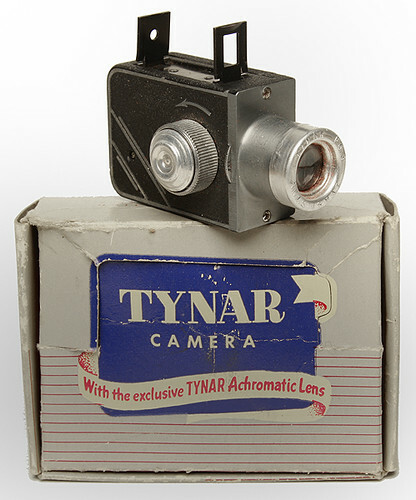 The Tynar was a camera for 16mm film. It used 16mm film in metal cartridges. It was offered starting 1949 by Phil Kalech Company, Chicago, and by the Tynar Corporation which had plants in Chicago, Cincinnati, Los Angeles and New London, may be the maker of the camera. It was advertised as delivering cheap prints: 1 US-Dollar for fourteen 2½×3½" prints from one film, including its development, what alltogether had to be made in one of the four Tynar laboratories. The cassettes were marked "property of Tynar Corporation". Maybe these cassettes (Film magazines) were refilled in the plants with the Tynar Panchromatic film. A Tynar cassette was very small since the image frame was on the outer side of its film transport channel. All better known 16mm film cassette systems used larger cassettes with the image frame on the opposite side of the film transport channel. The camera had a collapsible two-frame viewfinder, a film advance with exposure counter, an achromatic anastigmat lens, a single speed shutter and choice between apertures f6.3, f11 and f16. This page was last edited on 1 August 2013, at 21:33.